BLAEU - Nova totius germaniae descriptio. BLAEU, W. - Nova totius germaniae descriptio. Nova totius germaniae descriptio. 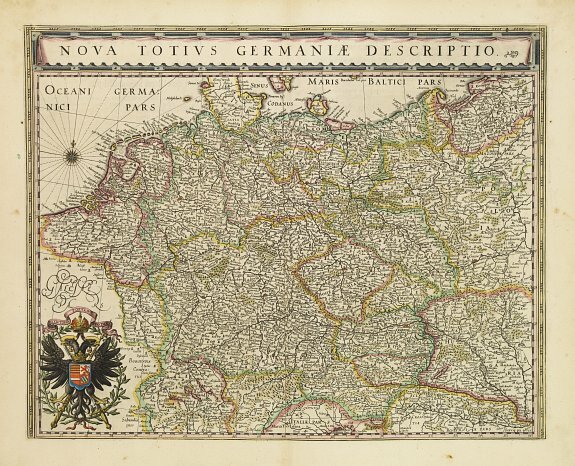 - BLAEU, W.
Title : Nova totius germaniae descriptio.. Size : 15.4 x 19.1 inches. / 39.0 x 48.5 cm. Description :Detailed and finely engraved map of Germany, Poland, Netherlands, Belgium, Austria and a little part of Italy and Croatia. Embellished with an enormous title cartouche along the upper part of the map and a beautifull coat of arms with two black eagles, weapons and crown in the left-hand lower corner. Condition : In very fine condition. A good and dark impression. Paper very slightly age-toned, printed on heavy paper.